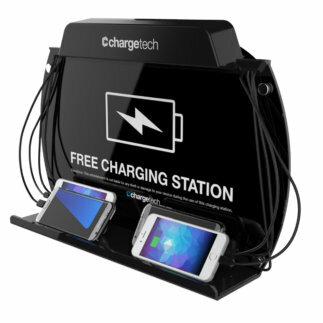 SEE WHAT'S NEW AT CHARGETECH! We recently added a few of these tables to our physical therapy clinic waiting room. It's become a big hit with our clients as most of them are in wheelchairs and need special accommodations. The cellphone charging is just a huge bonus that we decided to make available, and our clients have never been happier. When we decide to expand our practice, we plan to have most our surfaces replaced with this table. These charging carts are simply amazing! We purchased 4 disinfecting carts for our growing number of tablets we distribute amongst our students. These units not only charge the tablets quickly, but they clean them too! The one press and go system is so easy and everything is ready to go for our students when they come to class. This saves faculty so much time not having to deal with a spiderweb of cables. We are a Luxury Mobile Charging Concierge Service for small to medium events, such as weddings, fundraisers and private parties. We offer our customers lots of options for keeping their guest powered up and connected, however the Power Floor Stand is very popular We show and demonstrate all options for there guest to our perspective customer and nine time out of ten they chose the Power floor Stand.